Millions of website owners are eager to find the right businesses to host banner ads for and millions of businesses are eager to find the right websites to advertise on. Affiliate ad networks are there to play matchmaker. That’s how they work, so here are three reasons why your business should sign up to one right one. All of this is important work and it’s not enough to do it in a rush. It requires attention and that comes in the form of time. Even if you work hard, there’s often just not enough hours in the week to do all of that and find advertisers to monetize your online presence on a case-by-case basis. For business owners, all of this is also true. After all, a business needs a website, that business website needs a blog, and both of those things need to be updated regularly. On top of all that, the business itself needs to be run. Spending time on searching for the right website to advertise on — or the right advertiser to work with — is a waste. This is especially true when an affiliate ad network can do the same thing instantly, using immense amounts of data. By contrast, signing up to an affiliate ad network is a process which takes minutes. For publishers, it means that you can start making money straight away. For advertisers, it means you can start advertising straight away. The result is more time spent on your business. From the point of view of a business, the success or failure of a sponsorship deal can be hard to measure. You might sell more of that product, but how much of that is directly attributable to the money you’ve spent on the sponsorship? In terms of money spent, your exact ROI is unclear. From the point of view of a publisher, the frequency of sponsorship deals is unreliable. You have one now, but how much can you count on it to continue to fund your work? In terms of time spent, your exact ROI is also unclear. For advertisers and publishers, reliability, repeatability and consistency need to be clear. Advertisers want to know exactly what they are paying for and publishers want to know exactly when they’ll be paid. This is why the best direct ad networks offer CPI, CPO, CPM, CPC, and CPA payment options so that advertisers can pay for results. It’s also why the best direct ad networks offer websites a variety of payment options — from Bitcoin to PayPal and everything in between. Data is what fuels an affiliate ad network; it’s one of the many reasons that they are so reliable. Information such as the user’s language, web browser, device, operating system and even the keywords on the page itself all help to inform the kind of ads which are displayed. This is great for advertisers, as it means the right message is shown to the right person, but it’s also great for publishers, because a website is often judged by the quality of its ads. Data is key here, but it’s not everything. 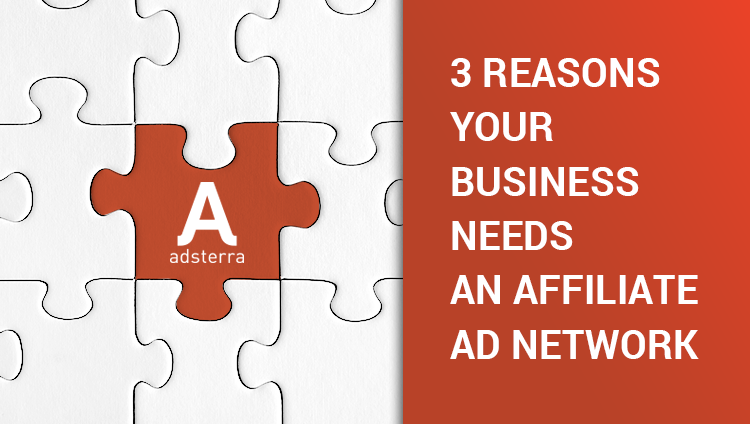 The reason Adsterra is the affiliate marketing network for over 4,000 different publishers is that data-driven analyses are also backed up by creative and innovative new ad designs and a great user interface for advertisers. The best affiliate marketing networks are data-driven, performance-driven, creative and time-saving. It’s because of all those reasons that Adsterra is the choice for over 4,000 publishers. Sign up today and start making money instantly.